Modem maker Huawei has introduced what it claims is the world's smallest and lightest HSDPA connection-sharing gadget yet. 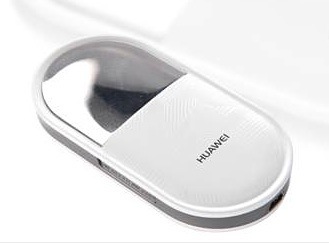 Dubbed the i-Mo and the size of "a small key chain", the unit looks rather like Huawei's old E220 HSDPA modem, but it has an 802.11g Wi-Fi pick-up on board as well as a 7.2Mb/s HSDPA and 5.6Mb/s HSUPA feed for the internet link. Pics show it'll come with a small dock into which its mini USB port connects. It also has Flash storage on board, allowing it to operate as USB drive. Alas, Huawei didn't say how much memory the i-Mo contains, but it'll undoubtedly say more when the unit is formally launched next week at Mobile World Congress.